The Beach Club certainly has a great location going for it. On the not-so-polluted (yet) Neelankarai Beach Road, ita��s just a quick drive away for a seaside meal or to spend a day peppered with beach walks, pool games, sun bathing and some reading. Actor, director and cinematographer, Suresh Chandra Menon has transformed an approximately 4,500 sq ft beach-facing bungalow into what he hopes will be the citya��s first day resort. 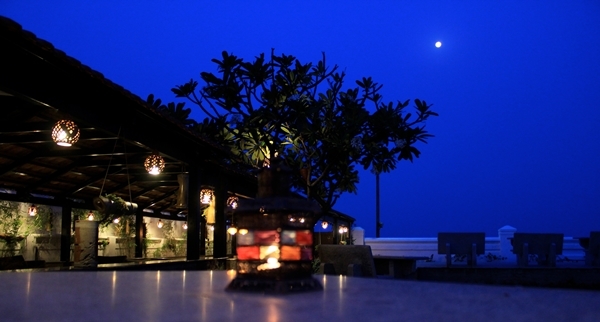 But for now, The Beach Club operates as a fusion Continental restaurant, with chef Anand Sankaranarayanan at the helm. Sankaranarayanan also headed the kitchen of Menona��s previous F&B project, Cornucopia. We are greeted by Zorro, the boxer, on our visit for a tasting session, weeks before the restauranta��s opening (and are delighted to learn that The Beach Club is pet friendly). Nothing formal, just a small gathering of friends for a communal dinner. Luckily, someonea��s late and we have time for a quick tour of the property. Walking past dining tables, we pass through a mini library and spa, before reaching the roof, where a cabana will host couples for private dinners with a view.A� The whole place feels cozy, welcoming and bears testament to Menona��s talents as a cinematographer. But you may have to wait for the day resort to launch (within a month), to see for yourself. Back at our communal table, the chef explains that the food here, will be on the same lines as Cornucopia, a�?with influences of Cajun, Mediterranean, Middle Eastern and Indian cuisine.a�? Dinner begins with a chilled green peas and potato soup, flavoured with crushed, fried red chillies. We lose count of starters between nibbles of grilled chicken and ricotta and cheddar-stuffed aubergine rolls. And after the Veracruz fish and lemongrass chicken, I lament at having no space left to try just one more prawn in blackbean sauce a�� the hit of the evening. Some of these will make it on to their a la carte menu that launches in two weeks. Till then, ita��s a buffet set to the tune of waves crashing on the shore.